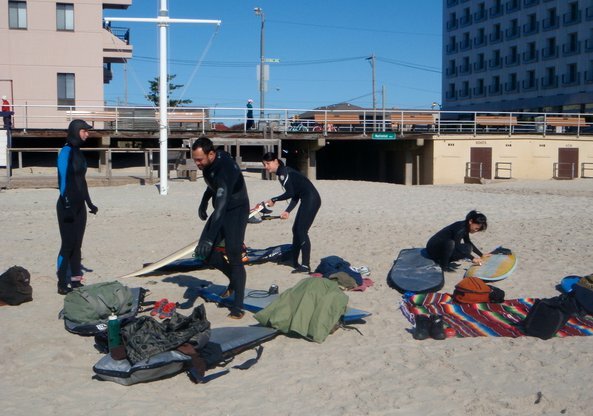 Although it may seem a little crazy, surfing in the winter, especially in the NY/NJ area, can prove to be a super fun and rewarding experience. Don’t get me wrong, it’s not nearly as enjoyable as those summer days where you can walk to the beach in shorts, bikini, and flip flops. Winter surfing requires will power, courage, and most importantly the correct gear. Once you are properly geared up, and mentally prepared, get ready to see a huge progression in your surfing. What you will immediately notice during the winter are empty line-ups and plenty of waves all to yourself – basically a surfers dream come true! In 2010, I had my first winter surfing experience when a few close friends, who surfed the winter before, talked me into it. I knew I needed the proper gear: wetsuit, hood, gloves, and boots are a must. If you are seriously considering surfing this winter, first and foremost, you must invest in quality gear. On average, you will spend close to $500-600 but the investment is well worth it when it’s 30 degrees or colder outside. A good surfing wetsuit – I would recommend a neoprene suit with a thickness of 5/4/3 mm with a built in removable hood. Look for a suit that has minimal seams. Seams should be sealed (glued) if possible to keep water out. Don’t go the cheap route here. A good quality suit will keep you dryer, warmer, and last you a lot longer than a cheap suit. Make sure to try the suit on before purchase if possible. It should fit very snug to your body. If there are gaps between you and the suit water will flush in and you will get cold very quickly. The goal with the wetsuit is to stay as dry as possible. Look at brands such as XCEL, Roxy, Billabong, O’Neill, Patagonia, and Rip Curl. 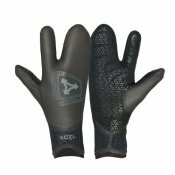 Gloves – Get a pair of ‘Lobster Claw’ gloves with a thickness of 5 mm or 7 mm. The thicker the neoprene the warmer your hands will be and the longer you can surf. The gloves should be snug but not too tight so that you don’t lose circulation in your hands. Tip – Put your gloves on last and have a friend help. You can fold up the end of the wetsuit at your wrists, put on the gloves, and pull the wetsuit over the top of the gloves to keep water from getting in. Boots – Get a pair of boots that fit snug at a thickness of 7 mm. I would not recommend going any thinner. Your feet are in the water 99% of the time you are surfing so they will get cold fast. Boots usually come in men’s shoe sizes but be sure to try them on before purchasing. Tip – Put your boots on after your wetsuit and before you have the gloves on. 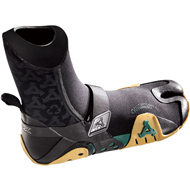 Fold up the bottom of the wetsuit at your ankles, put on the boots and fold the wetsuit over the boot tops. This will keep water from coming in. Hood – If you get a suit with a built in hood, all you have to do is pull your hair back and out of your face, pull the hood over your head and zip it into the suit if it’s removable. You will need a friend to help with this step unless you have a mirror to look into. If your suit does not have a built in hood you can purchase a hooded vest. You will put this on first, then your wetsuit. You can also wear a short sleeve rash guard under the hooded vest for another layer of warmth. When you have all the gear you need, you will also need the following items to have an enjoyable winter surf sesh. Thermos of hot tea – this will warm you up from the core between and after sessions. Surfing ear plugs – you want to avoid getting water and wind in your ears as much as possible. Over time, you may run the risk of developing surfer ear which is an abnormal bone growth within the ear canal. Even with the hood on, you will want to wear these. Keep in mind you won’t be able to hear very well but you can socialize after surfing. Vaseline – on those windier days, you can put a little on your cheeks to prevent wind burn. Sunblock – if it’s sunny, you can still get a sunburn so protect yourself from sun damage at all times. Hat/puffy jacket/gloves/Ugg style shoes – all these items will keep you warm once you are done surfing. Your core body temperature will have drop a little so the quicker you can warm up the better off you will be. If you have a car, wear your wetsuit (just up to your waist) and boots while you drive to the beach to heat up. Once at the beach, get fully suited up in the car and have a friend help you put on your gloves once you are ready to jump in the water. You want to avoid bare skin exposure as much as possible. The only part of your body that will be exposed is your face through the hood. If you’re like me, and come from the city to the beach via train, you can suit up on the train (in the bathroom preferably) and walk to the beach with your wetsuit and boots on. I will put my gloves on when I am just about to jump in the water. Once in the water, the best advice that I can give is to listen to your body! If you’re getting really cold, get out of the water and warm up. Drink hot tea, run around or find protection from the elements. This is no time to be Super Woman. Hypothermia can set in quickly and can be deadly. On average, I would surf 90 minute sessions. Between sessions I drink hot tea, cover up with a thick towel or jacket and run a few laps on the beach to warm up again. You can also jump in your car if it’s close enough, blast the heat, and go back out once you are warm again. Also, select the days you go out wisely. Clean conditions are ideal so you don’t have to duck-dive in frigid waters. Light winds are preferred too and SUNSHINE! I hope you find this guide helpful. If you have any other tips, please leave a comment. I never thought I would be surfing all year round, but I thoroughly enjoy winter surfing in NY. I’m already dreaming of those empty line ups! P.S. I surf in Long Beach, hope to meet you some day! So glad you liked the post! I hope it encourages more women to surf year round 🙂 Hopefully I’ll see you in the water soon.